In MediRecords, the Sessions functionality allows you to refine the calendar availability for both your practice and individual providers; this not only reflects their actual practice hours, but can also include meal breaks, half-days and off-site work (e.g. home visits). This works in conjunction with your Appointments calendar to accurately show who is available. To access sessions, click More and select Settings. 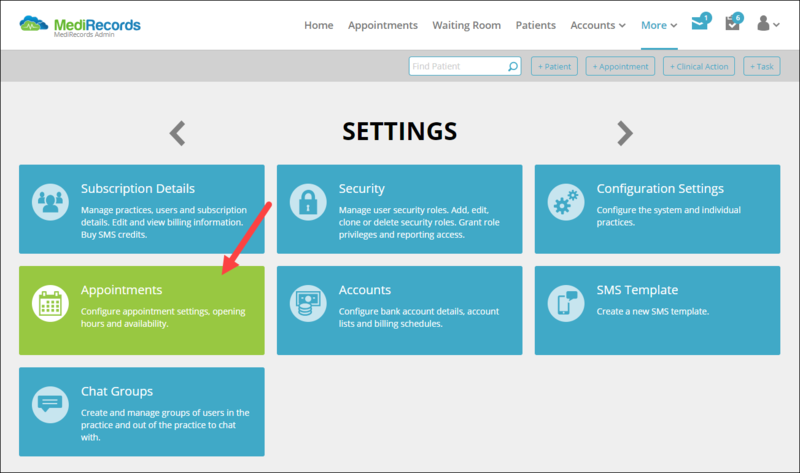 Within Appointments, click on the practice that you wish to configure sessions for. In this tutorial, we will select MediRecords Admin as an example. Within the Practice screen, select Sessions. You will be brought to the Sessions screen. Sessions are divided into three sections - Regular, Extra, and Holiday. These are sessions that are set within the operating hours of your practice. These are sessions that are used to indicate provider availability that is outside the operating hours of your practice. Appointments which cannot be booked in Regular sessions can be booked in Extra sessions. These are sessions that are used to indicate period of time where the provider(s) and/or the practice are on holiday. During these sessions, no appointments can be booked. This session indicates that this provider will work Tuesdays from 8:00 AM to 11:30AM, starting on 20 April 2018 and finishing on 20 April 2023. Cycle 1 of 1 indicates that this will happen weekly with no exceptions. You've completed another MediRecords Tutorial. You should now have a brief understanding of how session availability works.